Comes in 3D sleeve supplied with bespoke '3D Fabreeze Vision' glasses. Pressed on crystal clear vinyl with blue & red splatters to match the lenses of the 3D glasses. 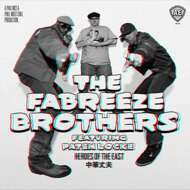 Following the almost forgotten 90’s Hip Hop tradition of a 2nd 12” from an album with extra tracks or remixes, The Fabreeze Brothers a/k/a Paul Nice & Phill Most Chill return with a single release of one of the most popular cuts from the hugely successful Fabreeze Brothers album, Heroes of the East featuring Paten Locke. Included here are the Clean Martial World Version for the radio plus the Original Version of ‘Heroes of the East’ featuring some incredible guest scratches by Jorun Bombay that do not appear on the Martial World version found on the album. For extra value for money we’ve backed this one with the ‘Blue Sheepskin Remix’ of Fashion Plate which was originally only a hidden track on the CD album. Instrumentals of all 3 vocal tracks are also included to make it a bumper 12” package! To make this one something a little special for Fabreeze Brothers fans our design wizard Mr Krum has created a 3D sleeve and conceived a crystal clear vinyl design with red and blue splatters to match the lenses of the bespoke printed ‘3D Fabreeze Vision’ glasses. A pair comes supplied with each copy in what must be yet again another first for the Hip Hop vinyl world - again pushing the packaging boundaries following the incredible custom die cut sleeve found on the 1st edition copies of the album. The overall design aesthetic is a nod to Paul Nice’s love of the Shaw Brothers martial arts films and when wearing the 3D glasses the Rez Ones photography appears to jump out of the sleeve!